Since medicines are often easy to take out of their packaging, they pose a risk to children who might be tempted to unpack and eat them. Especially children aged between one and three cannot distinguish medicines from candies, a mistake that can easily have severe consequences. The newly developed child-resistant packaging follows a novel approach and thus delivers a high degree of safety for children. The starting point of the design was the fact that children of that age have shorter fingers than adults. Standard medicine boxes are usually designed to allow the medicine to be taken out easily; this packing makes taking it out more difficult by introducing an inner and an outer box. 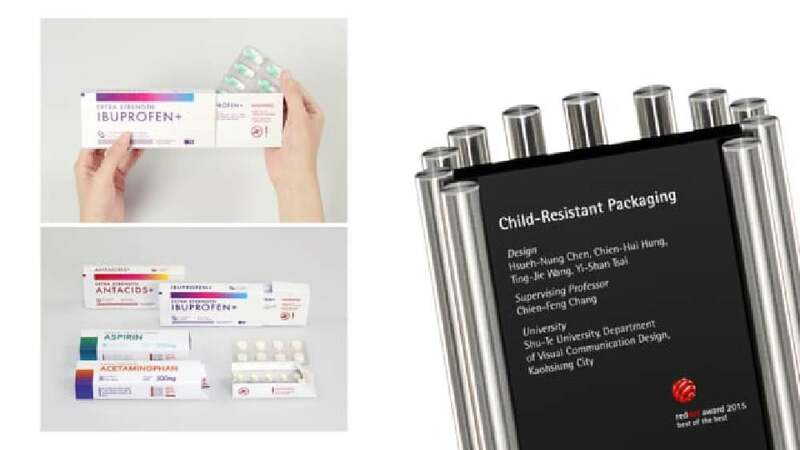 The space between the outer box and the additional inner box, which safely stores the medicine inside, is long enough to keep children from reaching the medicine, which prevents them from ingesting it by accident. The result of a systematically implemented design idea, this packaging offers a high degree of safety for children. The solution convinces with its simplicity as well as an impressively innovative design approach. It is based on a clever principle that is highly logical at the very first glance. This packaging can actually save lives and does without a complex folding technique or complicated underlying technology.